Attendance on Demand is provided by Secured Payroll Partners (SPP) as a time and attendance service that calculates hourly or salaried wages, manages employee time and wage data, and meets the needs of any sized organization. Time and attendance services provided by Secured Payroll Partners (SPP) track employee working time while maximizing labor dollars. They automate employee timekeeping from the employee punching at a time clock to the employee’s total hours being sent to payroll. Sophisticated calculations occur in the background, making sure the employee is paid correctly. Your organization’s pay rules are incorporated in the calculations. Time and attendance also handles employee scheduling. Employees with regular schedules can be scheduled for months ahead of time, automatically. Supervisors can easily adjust employee schedules on the fly. Labor budgeting can add clarity to the scheduling process, helping supervisors maintain appropriate ratios such as the number of registered nurses per patient or the right number of cashiers for the projected hourly sales. The time and attendance service maintains company-determined attendance standards for your employees. Any divergence from the schedule, or exception, is flagged for the supervisor. Points systems can initiate consequences or rewards that relate to employee attendance. From preventing minors from taking short lunches to rewarding employees for good attendance, the time and attendance service reinforces your policies and keeps supervisors abreast of employee performance. The time and attendance service can perform additional functions like processing requests for time off. For instance, the employee can request time off using employee self service. The supervisor is then emailed and the request is also displayed in his or her dashboard to be approved or denied. Requests can be evaluated together so the supervisor can make a fair and logical decision. If the request is approved, the employee is scheduled for the leave time and the leave hours are automatically deducted from his or her benefit bank. Attendance on Demand incorporates powerful programming intelligence that can automate even the most complex HR and payroll policies. An Attendance on Demand specialist works with you to learn your business rules. Our specialist then configures the system to reflect your pay guidelines, attendance policies, benefit policies, and elements of your business operation. Attendance on Demand captures your complex payroll policies to comply with important labor laws such as FMLA and FLSA. Pay rules are configured to apply your policies accurately and impartially. The following list describes just a few of them. 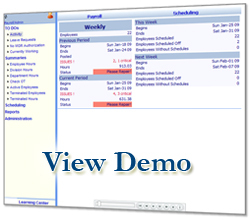 Attendance on Demand can track different pay periods for different groups of employees. For example, if salaried employees are paid semi-monthly, and hourly employees are paid weekly, the system tracks different pay period for each group. Attendance on Demand can calculate and combine different types of overtime pay, for example, daily overtime and pay period overtime. It can also automatically apply overtime on special days such as Sundays, the 7th consecutive day worked, holidays, and so on. Overtime rates and policies can automatically adjust to comply with Fair Labor Standards Act (FLSA) standards, California overtime rules, and other labor laws or union regulations. Attendance on Demand can apply different lunch rules for different shifts, automatically deduct for lunch when employees don’t punch out, enforce lunch breaks at specific times, vary lunch and break amounts based on shift length, and more. Attendance on Demand can enhance pay based on your rules for shift differentials, transfer departments, work locations, employee status, hours worked, and many other factors. Extensive, flexible premium rules can accommodate complex union, manufacturing, and healthcare pay rules.